Juicing is different than simply blending all your produce together. When you throw your produce in a blender, the blades will tear up all the fibers and take away a lot of the nutritional value that is contained in fruits and vegetables. Juicing is a way to avoid this from happening. Juicing will allow you to extract the juice from fruits and vegetables by crushing them as opposed to blending them. The end result will be a healthier juice that contains an increased amount of vitamins, minerals, and dietary fiber. Juicing allows you to consume all of these healthy nutrients quickly in liquid form as opposed to having to eat them individually, while still receiving all of the nutritional benefits from them. There are three main types of juicers that you can choose from. The right juicer for you will depend on what you are looking to get out of it. We will go over these juicers below so that you can get an idea of what type of juicer is right for you. 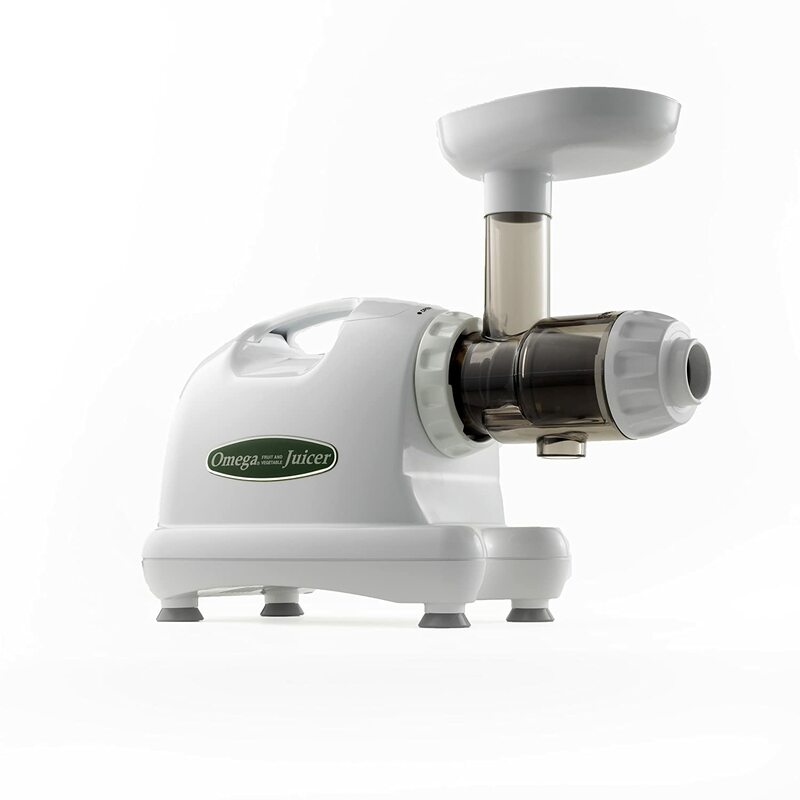 A centrifugal juicer uses centrifugal force to extract juice from your produce. It spins at extremely high speeds. 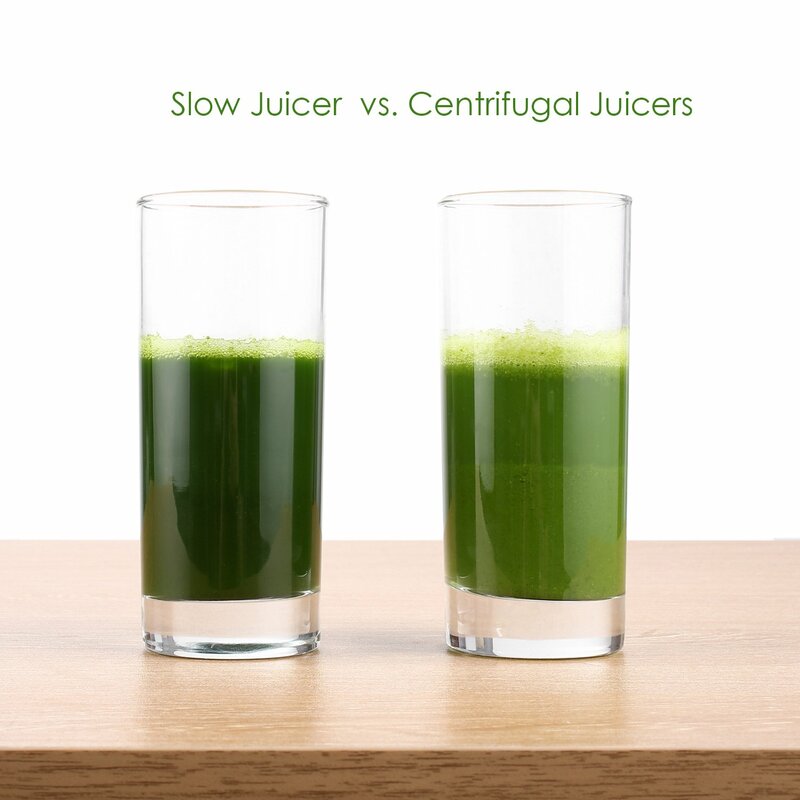 The centrifugal force that is created squeezes out the juice from the produce. These juicers work quickly, but they can only handle small amounts of produce at a time. They are very loud and they are not ideal for people that want to juice in larger quantities. A triturating juicer uses two different gears to squeeze the juice from the produce. The gears grab the produce and with shear force, it will squeeze the juice out and discard the pulp as it runs through the appliance. This is good for leafy greens; however, it is not ideal for soft fruits like oranges or bananas. These types of juicers are difficult to clean and they are hard to use, especially for those who are not used to using them. The masticating juicer is our choice for the best type of juicer. A masticating juicer uses an auger that slowly crushes produce against a screen. This then squeezes the juice out of it and separates the pulp from the liquid. The auger rotates slowly, usually at 60 to 80 RPMs. This will increase the time it takes to do your juicing, however, its slow moving motor will prevent any heat from accumulating. This is helpful because heat has been shown to damage some of the nutritional value of the produce. Masticating juicers are exceptional at getting the most juice out of your produce and protecting the nutritional content that you get out of it. This is why we recommend masticating juicers as our juicer of choice. The best masticating juicer will offer you many benefits. They are perfect for leafy greens like spinach and kale. They will be able to get the most juice out of your produce because of the way it extracts the juice from it. The low speeds that the motor runs at will keep the temperature low and the noise down. It’s a great option for those that want to be able to use their juicer for all types of fruits and vegetables from apples and pears, to spinach and carrots. 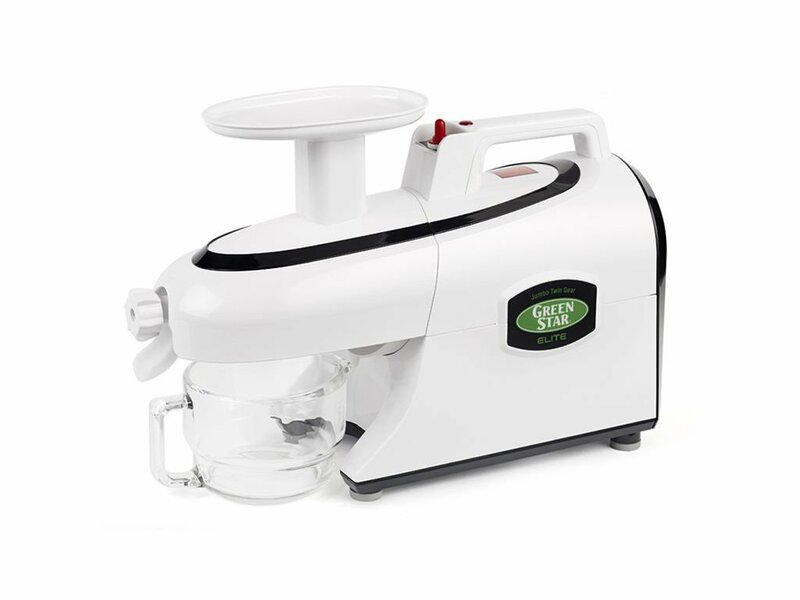 The Omega J8006 Nutrition Center Juicer can produce an impressive volume of juice thanks to its strong motor, no matter how difficult the produce is to extract juice from. It is well-built. It is built with a sturdy, small and compact design. It’s also very easy to operate. It is perfect for someone is looking for a juicer that is looking for something simple and reliable. This juicer comes in eight different colors including black and chrome, green, red and many more. It runs at 80 RPMs and is resistant to clogging and overheating. It is a very quiet machine, which is nice if noise is a factor for you. Its quiet motor will allow you to do all the juicing you need to do without disturbing the people around you, morning or night. It has an automatic pulp ejection feature that will make the juicing process that much easier for you. 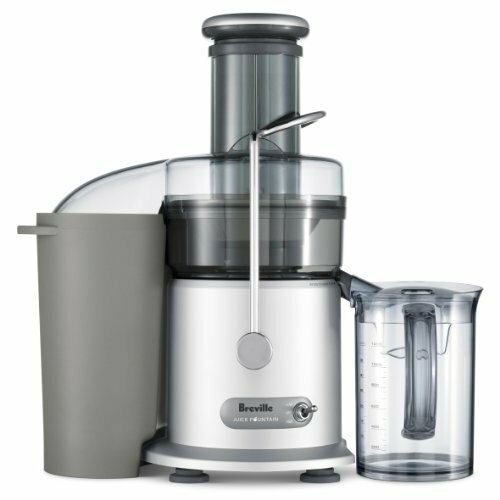 Overall, this is a great juicer for someone that is looking for an all-around option. It has a few negatives, like its small food chute, but we are really nitpicking to say that. In reality, it has very few flaws, making it one of our favorite juicers that we have reviewed today. It’s a great juicer that continues to be one of the best sellers on Amazon and with other online retailers. If you are looking for an aesthetically pleasing, small and quiet machine, this should be one of your strongest considerations. 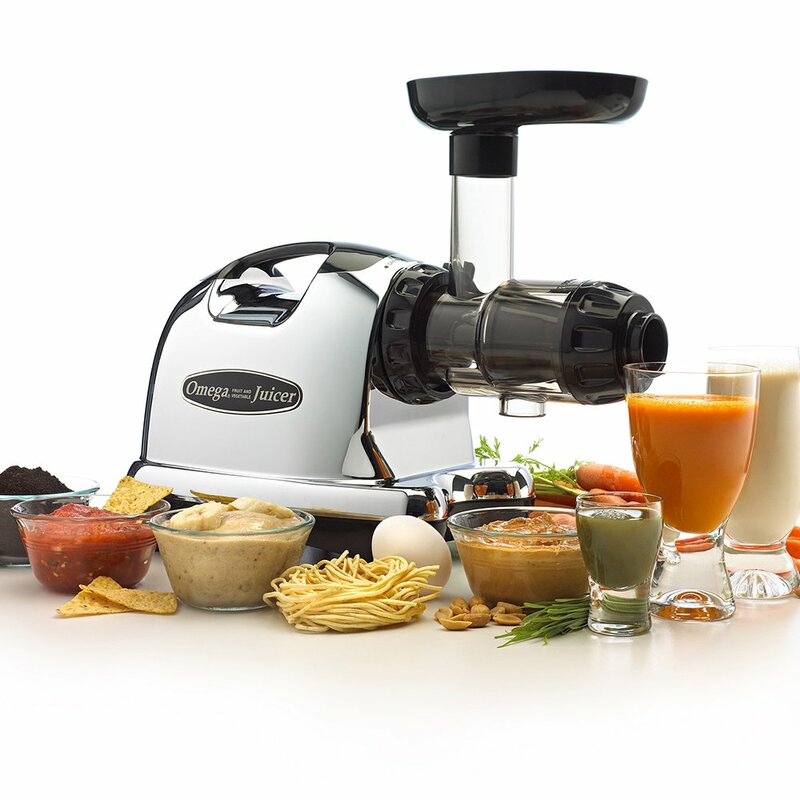 The Omega J8004 Nutrition Center Commercial Masticating Juicer will help you bring simplicity back to juicing. It has a dual stage juicing process which prevents clogging, heat buildup and foaming from occurring. It runs at 80 RPMs, similar to the J8006 from above. When you are using it, its automatic pulp ejection feature will allow you to juice continuously without stopping to unclog it. It will automatically remove the pulp as you continue to juice. The Omega J8004 is available in white and it has suction cup feet which will allow you to create a solid hold against any countertop. It is specifically designed for someone is looking for a cheaper option than the J8006, but wants the same type of performance. For those looking for the best masticating juicer at a lower price, this is a great option to consider. This isn’t our top choice if you are looking for something that will look pretty in your kitchen; however, this brings everything else that you can ask for to the table. When it comes to performance, it’s hard to beat what this juicer can give you. It has a high yield output and it will allow you to get the most out of your produce when you juice it. We recommend this as our top all-around juicer that is still friendly on the wallet. 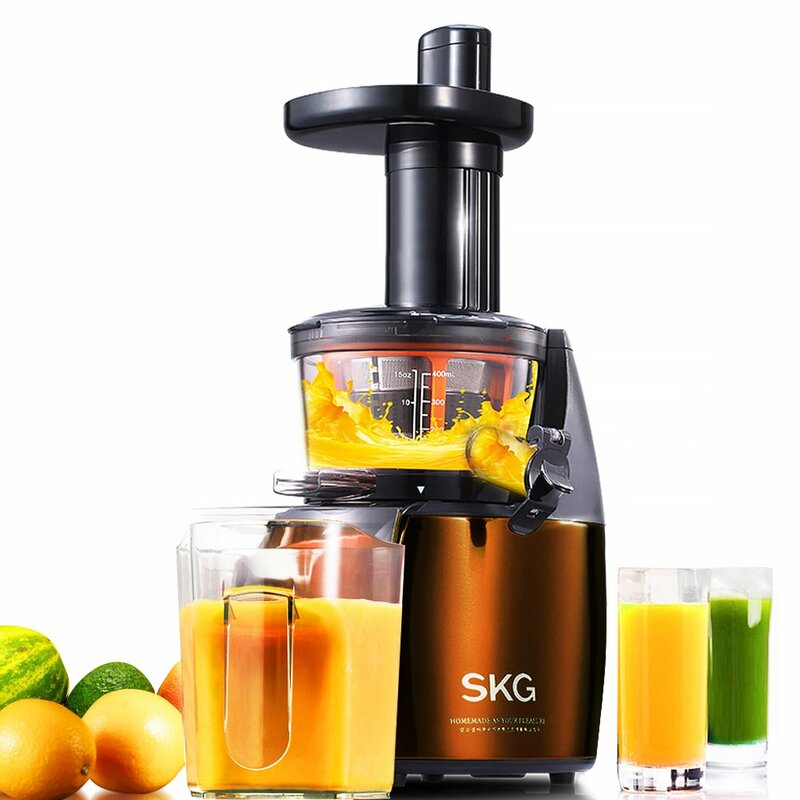 The SKG Wide Chute Anti-Oxidation Slow Masticating Juicer is an extremely low-speed juicer that will allow you to get the most out of your produce in both its nutritional content and the volume of juice that you extract from it. Because of its extremely low speed of 60 RPMs, it will prevent any heat from building up and burning away any of the nutritional value of the produce as you juice it. It has a large food chute that is 3 inches wide. This will allow you to juice the majority of your fruits and vegetables without having to chop and dice them up. When you’re dealing with something larger than 3 inches wide, you can simply slice it once or twice and throw it into this juicer. Its large chute and powerful motor gives you the best that you could ask for from the juicing process. As far as performance goes, this is our favorite juicer. It will be able to give you the best results without compromising any of the nutritional value that is in your produce as you juice it. The one knock that we have on it is that it juices at a really slow rate. This is because of how low its RPMs are. If you want to preserve the nutritional content as much as possible, this is a sacrifice that you are going to have to make when you are looking for the best masticating juicer. 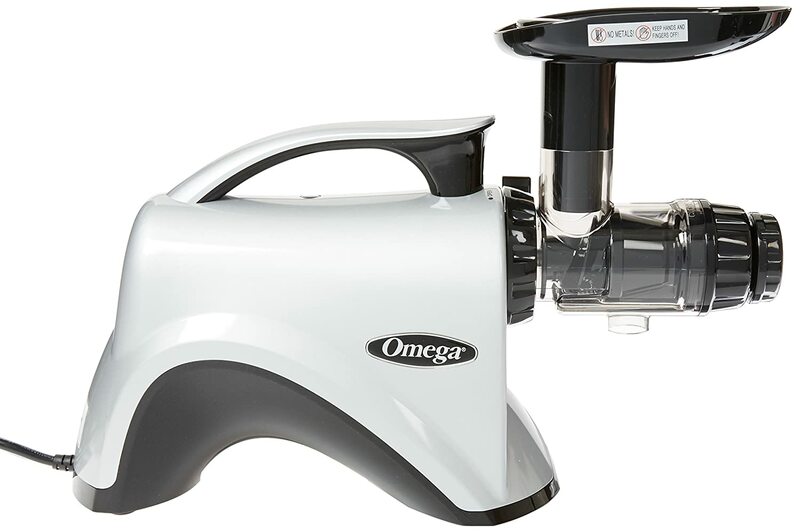 The Omega NC800 HDS 5th Generation Nutrition Center Juicer takes the Omega J8006 and turns it into a larger version. One of the most common complaints of the J8006 series was that the food chute was too small. This juicer is the answer to that. The food chute in this masticating juicer is nearly two times as big. It has a fully adjustable end cap. This will allow you to add additional pressure on the pulp to create an even higher yield from the produce. This is a larger model. It will take up more space on your countertop so keep this in mind if you are limited with your table space or storage options. This is a good option to consider if you like the J8000’s series, but you are looking for something larger. Its larger size will make it easier to feed produce of all sizes through it. This is our top recommendation for people looking for an easier way to enjoy the features that the J8006 provides. As long as you have the space to accommodate it, the larger food chute makes things a lot easier by reducing the amount of cuts you have to make in your produce before you begin juicing it. Because of its large size and its adjustable end cap, is the best masticating juicer to use on leafy greens like spinach and kale. 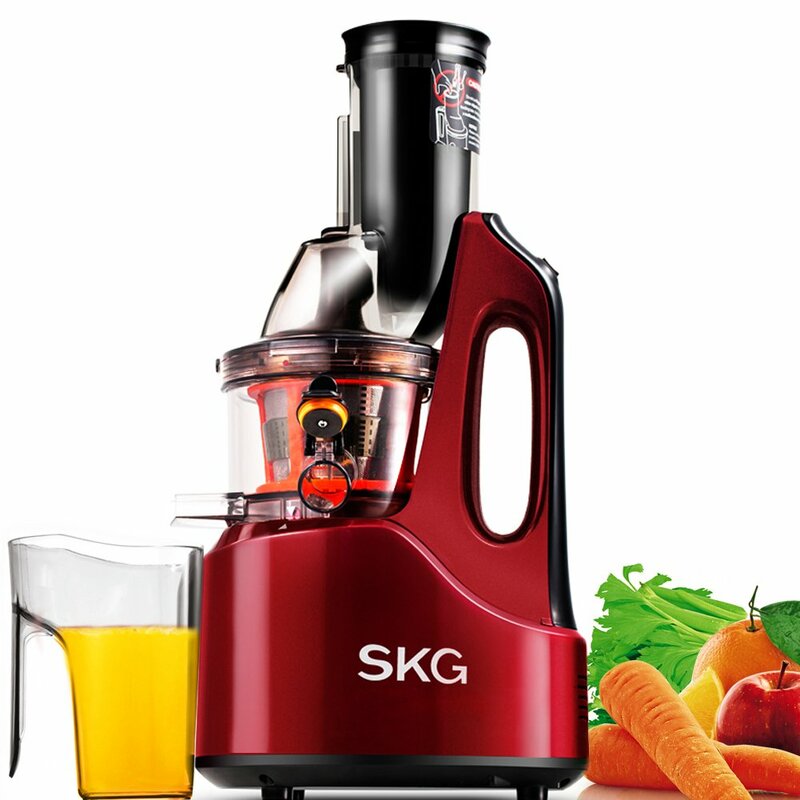 The SKG Premium 2-in-1 Anti-Oxidation Slow Masticating Juicer & Multifunction Food Processor is a juicer and preprocessor all in one. This is unique from the other juicers that we have reviewed because of the additional food processing capabilities it brings. If you are looking for a more versatile juicer, this may be the right appliance for you. This is a vertical juicer in which you insert the produce from the top down. It runs at a slow 65 RPMs, making it the second lowest juicer that we have reviewed. 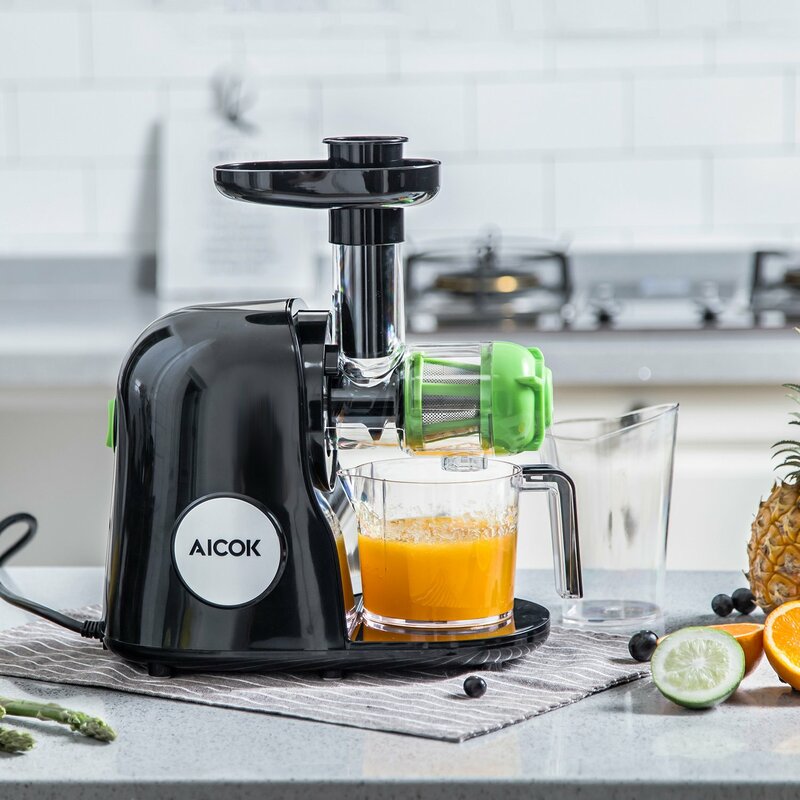 Much like the SKG Wide Chute Juicer, this juicer will allow you to get the most out of your produce without harming any of the nutritional content during the juicing process. It is a quiet machine that keeps the heat down and the fibers intact as you use it. This is a well-designed juicer that has added versatility with its food processor functions. Whether or not this is the right juicer for you depends on if you need the food processor or not. If you do, this is a perfect option. If you don’t, we recommend using one of the other juicers that are specifically designed for juicing. This is a low-priced appliance that is a great starter option for anyone that is looking for more flexibility with the way they eat and drink. As you can see, there are a lot of great options when you are looking for the best masticating juicer. If you are looking for the best all-around option, we recommend the Omega J8006 or Omega J8004 models. These juicers not only perform great, they looked great as well. If you need something that has a larger mouth chute, we recommend the Omega NC800, or the SKG Wide Chute models. Finally, if you want something more versatile, we suggest the SKG Premium 2-in-1 Juicer and Food Processor. Regardless of what you choose, all of the juicers that we reviewed today will provide you with an excellent juicing experience.